Let’s Loop Seattle is a public education and access advocacy campaign launched by the Hearing Loss Association of Washington, in cooperation with the national “Get in the Hearing Loop” campaign, launched by the American Academy of Audiology and the Hearing Loss Association of America. Let’s Loop Seattle builds knowledge about hearing loops, provides information and resources to facilities and users, supports certified users, and most importantly, strives to bring hearing loop technology to our region, to ensure that residents and visitors alike, can hear all this great region has to offer. Cheri Perazzoli. Director of Advocacy, HLA-WA, and Founder/Director of Let’s Loop Seattle. 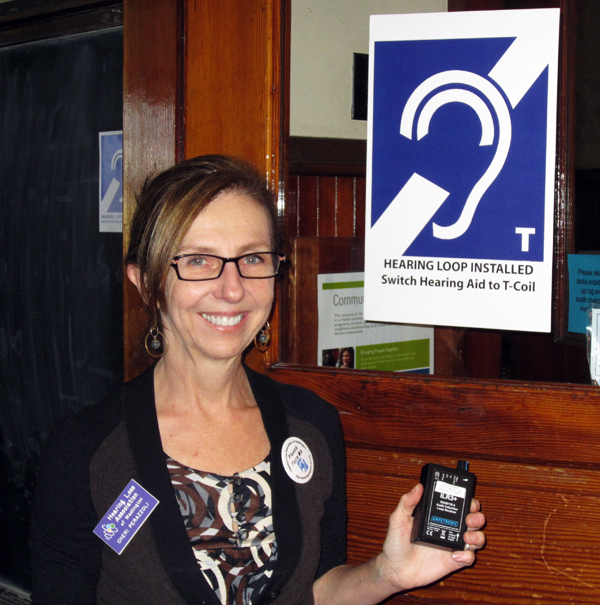 Cheri launched the Let’s Loop Seattle campaign after experiencing the benefits of hearing loops in the UK and researching the hearing loop movement in the US. Read her full story below. Contact Cheri Perazzoli. Laura Perazzoli. Marketing and Communications, Let’s Loop Seattle. Contact Laura Perazzoli. Nearly my entire life I have been hard of hearing. Although I was fitted with hearing aids my hearing continued to deteriorate over time, and I continued to experience routine limitations in my ability to communicate. In order to manage my hearing loss, I attended speech reading classes and continue to use a variety of assistive listening devices. I first discovered looping while traveling abroad in the UK. Imagine my surprise when, at the train station in Dublin, I was able to clearly hear the thick Irish brogue of the ticket clerk. The station’s counter was looped and the telecoil on my hearing aids allowed me to understand his announcements. The system was so effective that I was able to hear him even better than my normal hearing companions. Throughout the trip, I was thrilled to finally hear clearly—not only in museums and churches, but also in loud, busy train stations and airports, tasks otherwise unimaginable with my hearing aids alone. Since then, the loop has debuted at service counters, theaters, and meeting halls in America. This summer, I attended the second annual International Loop Conference in Washington DC where I met with like-minded individuals who have been instrumental in bringing hearing loops to public spaces across the United States. I realized then that I needed to help bring Hearing Loops to Washington state. Our goal is to build knowledge about hearing loss, hearing assistive technology, and hearing access. Let’s Loop Seattle advocates for hearing loop systems not only in Seattle, but throughout the Puget Sound, and across all of Washington state. You can e-mail us at loopseattle@gmail.com. We are purely an educational site. We do not sell or install hearing loops.